Stirling County gave themselves a massive confidence lift ahead of next weekend’s Tennents Premiership kick-off by acheiving victory over Melrose in the BT Charity Shield match at the Greenyards. Defeat for Melrose at home is something of a collector’s item these days such has been the Borderers’ success over the past few seasons. 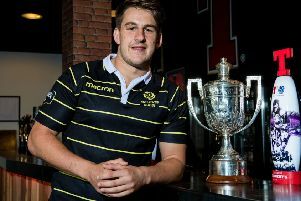 But against Stirling, the Melrose side, which has lost four key players to Edinburgh and the Scotland Sevens squad, was given a reality check by a County side that showed real ambition in taking the game to the Premiership and cup champions of last season. “We’ve been working very hard over the past couple of months and we’ve also recruited smartly.” said Stirling’s player/coach, Peter Jerecivich. Among the new valuable acquisitions are stand-off Andrew Goudie and No.8Ally Mackie, pictured, who both posted outstanding performances against Melrose. 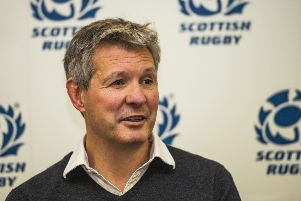 Stirling will also be pleased with the contributions of Strathallan alumni Murphy Walker and Cameron Henderson, centres Grant Hughes and Craig Robertson and flanker Hamilton Burr. For Melrose Fraser Thomson showed his try scoring appetite with a brace of touchdowns, Murdo McAndrew his understanding of the game and Patrick Anderson an eye for the gap. Stirling were in command at the interval when they led 20-7 from two Jonny Hope penalties and the full back’s conversion of tries by Jerecivich and Mackie to an Anderson try and a Craig Jackson conversion. A try by wing Charlie Dineen just after the break stretched County’s lead while simultaneously triggering a Melrose fightback. McAndrew crossed for a soft try before Thomson showed his experience by grabbing a brace of touchdowns both converted by Jackson for a 26-25 lead. Then in a dramatic finish Stirling were awarded a penalty allowing Hope to kick the winning points and claim a deserved win.